Rugby fans all over the world recognise the South African rugby team as a force to be reckoned with. The passion for this sport in South Africa is shared across the country as a whole, although not all children have the chance to formally learn how to play. Unfortunately this is a reality for many kids in the townships, and a trend that our gap year rugby coaching programme aims to reverse. Much of the raw talent for South African rugby comes from the townships, although few players ever get the opportunity to make it onto the international stage. 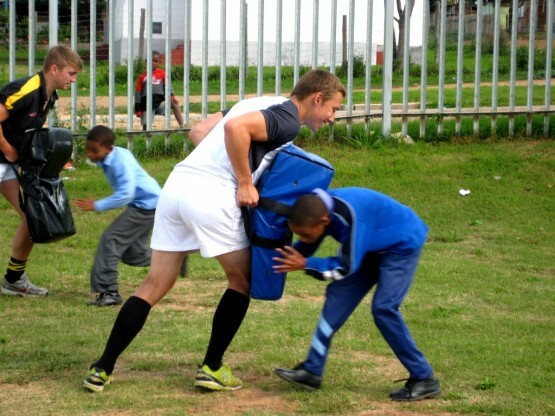 As rugby is not usually taught formally in township schools, many children never have the chance to fully develop their talents. This is where you, as a rugby coaching volunteer, step in. Volunteers travel around several of Port Elizabeth’s township schools each day, getting the kids out of the classrooms and onto the field. Here you will be coaching them their favourite sport: rugby. From fitness drills to passing techniques to games, you will take the lead in giving these kids a formal environment in which to learn this beloved game. There is ample opportunity for you to play too – the kids love for you to get involved – and we also have great links with local rugby clubs if you would like to play socially in your free time too. Bringing the formal education of sports to the townships is so important, as often this is their only access to play in such a setting. It also means that they can learn something outside of the classroom, as well as the multitude of qualities that sports can bring, such as teamwork and motivation. To bring smiles, joy and fun to these kids is one of the most rewarding things that you could do on your gap year or career break. Oyster welcomes volunteers of all backgrounds with a love for playing or coaching rugby. You can be of any level, as long as you are enthusiastic- from social rugby players, those representing their school, club or university, and even those who have experience of coaching rugby- you will each bring something to this project. The kids that you are working with may develop to go on to some of the schools of excellency that we work with, so this programme can give them such a boost. The programme runs from 5 – 12 weeks throughout the year. Oyster highly recommends 12 weeks as means that both you and the kids can get the most out of the programme. Oyster sends volunteers to coach a whole variety of sports in Port Elizabeth. The rugby coaching is just one part of the whole sports coaching programme. Rugby volunteers will be living and working with the volunteer coaches of all the other sports, and you can even coach a variety of sports whilst you are there. Just let us know which your favourite sports to coach are! For any questions about this project, do get in touch with Anne [email protected] who actually spent some time on this project!